Lu Bird Baby: Original Andrea Giveaway! Hi my name is Andrea and I wanted to introduce myself. I'm mom to Ian, 11 and Colton almost 3 months old, and wife to wonderful husband, Ben. Original Andrea was started as a custom scrapbooking business. 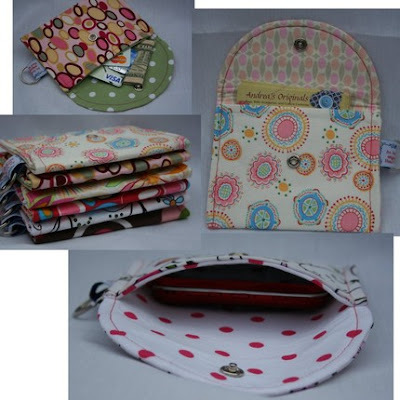 I used to scrapbook but found it too cumbersome and hard to store in my small home, so I converted the website to a blog and started offering custom sewn items. I've been sewing for about 17 years. I received my first sewing machine as a birthday gift and taught myself how to sew. I have always loved making costumes, bags, wallets, doll clothes, and other things for my friends and family. In April I found etsy and decided to sell some of my handmade items in my own etsy shop: http://originalandrea.etsy.com. In my quest to make my life easier, I developed my own feeding and diaper tracker. It's so much easier than writing a time down for each feeding. If breastfeeding, just mark an L or R on the start time and circle or cross out through the end time of feedings. It's also much easier to compare day to day feedings and diapers with a glance. I couldn't find anything with this type of simple design online, so I decided to start selling the pdf- fully personalized- in my etsy shop along with other baby accessories, and of course bags. Plus, I 'm always taking custom orders! Thanks for reading. Have a great day! Ever been caught in an unexpected shower during a diaper change? You need some of these bad boys. 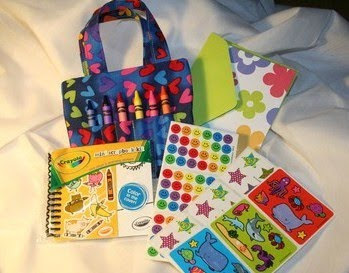 How about a crayon purse (full of goodies) to keep the kiddos entertained? let alone when you fed the baby last or which side you fed them on. Andrea came up with these awesome feeding and diapering charts. She even personalizes them and then emails them to you in a PDF so you can print them out to your hearts content. 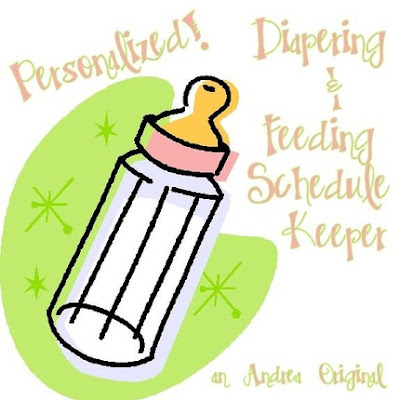 2 Personalized feeding and diapering charts (in PDF form)! If you are a new momma...you need one of these! Don't see any babies in your future? 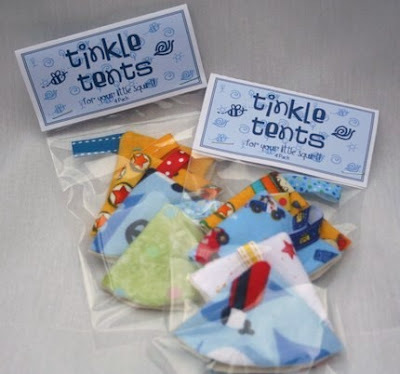 These would make such a great baby shower gift. Print a bunch on your computer, put them in a little notebook and give them to a mom to be. 1. Visit Original Andrea and heart her etsy shop. 2. Visit Andrea's blog and become a follower. 3. Become a "follower" of my blog "Lu Bird Baby." It's easy, just click on the link to the right. 4. Leave a comment telling us a funny (or not so funny) diaper changing moment! This is such a great idea. We are hoping to have a new one soon but if not I have a few friends that could use this. I follow your blog and heart her shop (I forgot to add that to the comment above). When my little boy was a newborn my mom was trying to change his diaper on her lap. My mom thought she was pro at changing diapers, but my baby proved her wrong when he peed all over her. We had a good laugh.